October 9, 2012 - Unfair Labor Practice (ULP) charges were filed Friday against The Boeing Company after the aerospace giant reportedly videotaped union members engaged in solidarity marches to support contract negotiations, seized employees’ cameras and deleted photos of the activities. 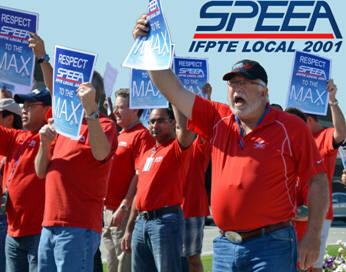 The Society of Professional Engineering Employees in Aerospace (SPEEA), IFPTE Local 2001, filed the two charges against Boeing after receiving complaints from members at multiple Boeing locations. Boeing surveillance and/or camera seizing occurred during lunchtime solidarity events by SPEEA members in Portland and Everett. The National Labor Relation Act (NLRA) protects employees’ rights to engage in concerted (union) activity and prohibits employers from interfering in these activities. For the past few weeks, SPEEA members have held solidarity marches, meetings and other events at many Boeing facilities to show support for their SPEEA negotiation teams. Marches ranged from a few dozen employees to more than 2,500 at the Everett plant. SPEEA continues to gather information about the surveillance and photo seizing and is asking members to document and report incidents to union officials. SPEEA and Boeing started meeting weekly in April to negotiate new contracts for 23,000 engineers and technical workers at facilities around Puget Sound, Portland, Utah and California. Boeing finally presented new contract offers Sept. 13. Engineers rejected that offer by 95.5 percent. Technical workers rejected the offer by 97 percent. SPEEA and Boeing met briefly on Tuesday, Oct. 2, the day after votes were counted. The next full negotiations session is scheduled for Wednesday, Oct. 10. A local of the International Federation of Professional and Technical Engineers (IFPTE), SPEEA represents 26,560 aerospace professionals at Boeing, Spirit AeroSystems in Wichita, Kansas, and Triumph Composite Systems, Inc. in Spokane, Wash.